BAGHOUZ, Syria (AP) — U.S.-backed Syrian fighters said Thursday a “large number” of Islamic State militants and their families are surrendering a day after intense fighting in the last speck of land the extremists still hold in eastern Syria. At the edge of Baghouz, the village where the militants are still holed up, men, women and children climbed a road that winds along a cliff overlooking what remains of a tent encampment, heading out. Members of the Syrian Democratic Forces said they searched the evacuees as they reached the front lines. Many of the people carried rolls of blankets and clothes but cast them aside as they made their way up the hill. Women carried babies as children slowly made their way up the rocky terrain. Most of the men appeared to be wounded, with many limping or walking with crutches, and they carried little aside from water bottles. Women were weighted down with duffel and plastic bags, and children holding onto their arms or to the black robes they wore. The sound of sporadic gunfire echoed off the cliff and U.S.-led coalition planes flew overhead. SDF spokesman Mustafa Bali said after an intensive offensive Wednesday from multiple fronts, “a large number” of IS militants and their families “started to surrender” early Thursday. The U.N. said in a Wednesday report that some 7,000 new evacuees are expected to arrive at an already overpopulated displaced people’s camp to the north over the next few days. 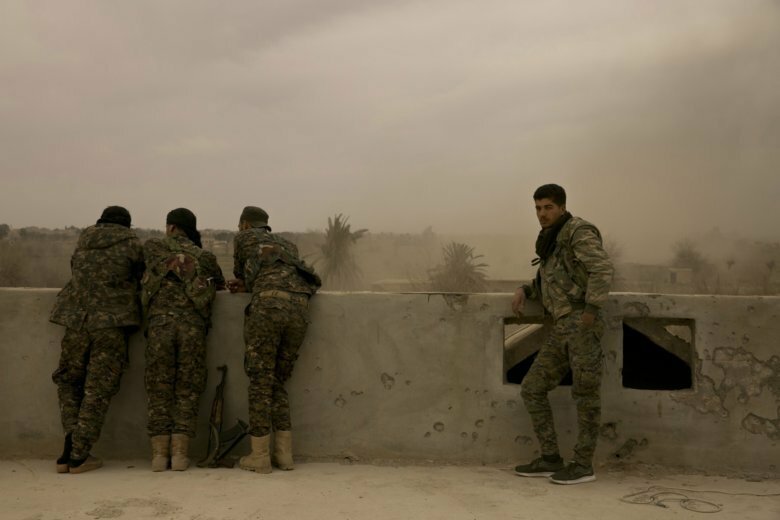 The SDF forces said the militants took advantage of dusty and windy conditions a day earlier to launch multiple counterattacks. The U.S.-backed forces fought back, repelling the offensive and apparently triggering the latest evacuation. Windy conditions continued on Thursday, and SDF commanders inspected front-line positions early in the day. A day after heavy bombing and clashes, it was quiet Thursday. By early afternoon, it began drizzling. The battle to retake Baghouz and surrounding villages began in September, but has been paused on a number of occasions to allow civilians out. Some fighters have surrendered in recent weeks, but hard-core militants, including many foreigners, are still holed up in the shrinking space along the eastern banks of the Euphrates River. Since early February, more than 10,000 civilians were evacuated from the IS-held pocket, most of them family members of IS fighters. The capture of Baghouz would be a milestone in the devastating four-year campaign to dismantle the extremist group’s self-declared caliphate, which once covered a vast territory straddling both Syria and Iraq. Wind and dust storms give the extremists a reprieve from airstrikes and aerial reconnaissance. The militants have also burned tires and oil to thicken the air cover above their tent encampment in Baghouz, where an unknown number remain holed up. SDF spokesman Adnan Afrin reported heavy clashes late Wednesday, saying IS sent suicide bombers to blast open gaps in their lines. At one point, IS had a group of SDF fighters encircled, but reinforcements managed to liberate them. The civilians evacuated from the area have been sent to al-Hol, a camp for the displaced. The U.N. Population Fund said Wednesday that more than 53,000 have arrived at the camp since December, mainly women and children. It said the camp’s 67,000 residents are living in “uninhabitable” conditions, with harsh weather, overcrowded tents and lax security. The U.N. said aid groups are overwhelmed and cannot access parts of the camp because of a lack of resources or safety issues. Some 200 people took part in violent protests in the camp earlier this month.